KJIPUKTUK (Halifax) - Atlantic Canada is home to the largest population of right whales anywhere in the northern hemisphere and if declining trends continue as they have, it’s on track to be the only right whale population in the northern hemisphere. Even for this resilient population of right whales, which feeds in our colder north Atlantic waters during the summer months, the situation once looked grim. But in the last decade, these dwindling cetaceans have made a surprising comeback. Zooplankton ecologist and oceanographer Kim Davies, who works in the Oceanography Wing of Dalhousie’s Life Sciences Centre, had a front row seat during this unexpected turn for the better. When she first become involved with right whale research, the Atlantic Canada population was estimated at 350 individuals and calving rates were virtually nonexistent. Now, their population is closer to 450 and appears to be on the rise. Davies said both Canada and the United States took steps to preserve this species by declaring certain stretches of ocean to be “right whale critical habitat,” areas deemed essential to this whale’s overall recovery. To this day, these critical habitats have enjoyed protections not afforded to other regions of our coast, including the adjustment of shipping lanes, which reduces the likelihood of collisions between ships and whales (To compare this situation to the plight of the Atlantic Blue Whale, who has not received critical habitat, click here). The two regions identified as right whale critical habitat in Atlantic Canada are the Roseway and Grand Manan basins. Roseway is on the southern tip of the Scotian Shelf and Grand Manan is in the Bay of Fundy. Right whales have benefited a great deal from this critical habitat, but Davies said these regions were selected as critical habitat at a time when very little was known about right whale migration and feeding habits. Modern research has shown they do feed in these areas en mass, but only for short periods of time before moving elsewhere. “We know right whales abandon their critical habitats quite quickly,” said Davies. While observing a pod of 60 right whales in the Roseway Basin last year, Davies and her colleagues were disappointed when after only three days of feeding, the pod vanished. The same happened in the Bay of Fundy and for the rest of the month, the whales didn’t come back. There are almost certainly more regions in Atlantic Canada that should be protected right whale critical habitat, but at present, Davies can only guess at where those regions are. With a research initiative lasting the next 3-5 years, she and her colleagues hope to find out. And their plan is to use whale songs to do it. Their project is called the Whale Habitat and Listening Experiment (WHALE) and it’s funded by the Marine Environmental Observation Prediction and Response Network. Davies and her team will be outfitting the entire Scotian Shelf with a network of acoustic devices trained to recognize right whale song, along with the collaboration of other organizations doing similar work throughout Atlantic Canada. With these 'listening devices', Davies plans to track these whales down. In their arsenal of acoustic equipment are bottom listening pods, which do their work from the seafloor, and a collection of mobile vehicles equipped with hydrophones (underwater microphones). Davies suspects there’s right whale critical habitat hiding along the Scotian Shelf, particularly in the LaHave and Emerald basins, and farther north near Louisbourg, all areas rich with zooplankton – whale food. Davies said the region farther east of the Scotian Shelf, toward the open ocean, is a research black hole, one they hope to fill. Davies said Canada has fallen behind the United States in right whale research over the last 20 years, but even U.S. research has given us a glimpse into the inadequacies of our conservation efforts. 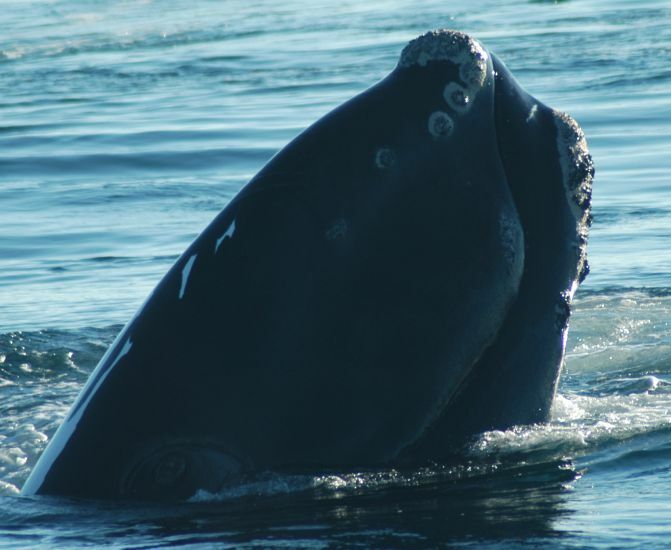 It was discovered the zooplankton congregations on which right whales feed can be unpredictable in where and when they occur, forcing right whale populations to follow these tiny critters wherever they may appear – like a game of whack-a-mole over the entire Northwest Atlantic Ocean. It was this discovery which inspired the National Oceanic and Atmospheric Administration’s recent proposal to classify the entire Gulf of Maine as right whale critical habitat, a proposal which is still in the very early stages. The reason for this is because any part of the Gulf of Maine could become right whale critical habitat at any one time, depending on where zooplankton congregate next. By Davies’ estimation, this proposal would amount to five times more right whale critical habitat in U.S. waters. Canada’s protected waters would be a fraction of that size. The Whale Habitat and Listening Experiment is meant to do more than just close this widening gap in research and conservation efforts between the United States and Canada. It’s also meant to expand a new and exciting initiative from the Gulf of Maine into Atlantic Canadian waters. Davies said the network of mobile acoustic vehicles they plan to let loose on the Scotian Shelf for their WHALE project could detect the presence of right whales and relay that information back to shore in real-time. If this information were then sent back to sea, to vessels in the same region as the right whales, ship captains could slow their vessels down to 10 knots (the recommended speed in whale occupied water), thus significantly reducing the chances of a ship strike. A similar network is already active in the Gulf of Maine. The potential for this acoustic network to benefit research and conservation isn’t restricted to the right whale. This equipment can follow the songs of numerous whale species, from the drawn out speech of sei, fin, humpback and blue whales to the excited clicks of the sperm and northern bottlenose whales.